Transforming Your Teaching - Description | W. W. Norton & Company Ltd. Successful teaching techniques informed by the latest research about how kids’ brains work. Teachers are forever searching for ways to help students raise test scores or improve memory and organizational skills. Brain research is finally beginning to show them how they can shape their daily teaching practices to best meet these kinds of needs, and more, in their students. But how is a teacher to make sense of all the studies, research reports, and papers? How can you know what will actually work in the classroom? 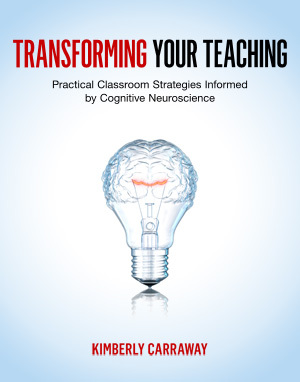 In this book, Kimberly Carraway, a leading educator and “teacher of teachers,” not only summarizes the most essential principles of how the brain learns, but also unpacks hundreds of ready-to-use applications of research in the classroom, translating the science into teaching strategies and learning activities that optimize student outcomes. Transforming Your Teaching is not about doing more. It’s about doing things more effectively. With brain-based tips for instructional design, knowledge assessment, and the enhancement of learning skills like time management, note-taking, attention, reading comprehension, organization, and memory, this user-friendly book will empower teachers, administrators, and parents to maximize retention and classroom success for their K-12 students.